In some cases, when a couple is having marital difficulties, the spouses can discuss the possibility of divorce, and decide to split amicably under friendly terms. The spouses may agree on the major issues, such as child custody and the splitting of marital assets, all without going to court or seeing an attorney. Some couples may even propose sharing an attorney in order to continue in the spirit of cooperation and save money on the divorce. It is not generally advisable for a couple to share an attorney in the divorce process, formally or informally. Sharing an attorney creates conflicts of interests that may cause greater problems down the road. While cooperation during divorce is a good thing that should be encouraged, a person seeking a divorce should always be careful about how they handle the divorce process in order to ensure that they do not give up valuable rights. Even with agreed cooperation, each person should seek legal advice from his or her own attorney regarding the divorce and any issues that may be raised as the couple splits up. 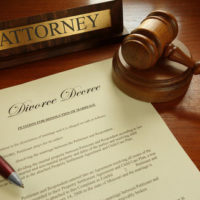 Couples who have figured out most of the issues in the divorce may also try a limited scope representation from an attorney. An attorney providing limited scope representation is only providing certain services that the client agrees on in advance. The attorney may be responsible for providing legal assistance on property issues if the spouses have already figured out issues related to parenting time. In choosing this limited scope representation, people should make sure that they understand the limitation of the representation, and understand that the attorney is not necessarily looking at all the issues in the divorce. Documents such as agreed parenting plans should be ideally drafted by an experienced attorney because they set the scene for how the parents will handle issues related to their children. Parents may not foresee all the possible issues that should be covered under the parenting plan, and amending an existing order later on could be difficult and expensive. If the couple is ready to agree on most issues, seeking legal advice as to the details of their agreement should not derail the settlement. Hiring an attorney does not necessarily mean that the divorce has to go through a messy trial. An attorney can draft the paperwork needed, advise you on your rights regarding marital property and issues related to children. Attorneys may also offer advice on alternate dispute resolution processes, such as mediation and arbitration, which would help a couple avoid the expense of going through a trial if an unresolved dispute arises later on. Cooperating with your spouse through a divorce is a good way to prepare to parent together and remain on friendly terms after a divorce. Hiring an attorney should not mean that the cooperation with your spouse should come to an end. For more information on how an attorney can assist you and still keep your divorce amicable, contact an experienced and compassionate Boca Raton, Florida divorce attorney at Law Offices of Schwartz l White for legal assistance.